I’d be lying if I said that I was at the point in my life where I fully and completely embrace my body. I totally get that it must be freeing to unconditionally accept yourself, I’m just not quite there yet. But I can say that I’ve come a very long way. My teenage years were a period of self-loathing, constantly feeling inadequate in comparison to others. I oozed insecurity. My harsh inner-critic was so loud, so cruel, so self-deprecating…..it was deafening. It has taken some growing up and some major work on my self-esteem to get to a place where I can genuinely say that I am enough. In the past, exercise was always exclusively about losing weight and most definitely felt like a chore. My exercise history was a pretty predictable pattern of trying a bunch of different workouts, but never really finding anything that I actually liked and giving up after a few months. I’d have a period where I would become completely sedentary and the apathy would set in. Then, I’d put on just enough weight to hate myself enough to get back to the gym. It was an awful, demoralizing cycle that kept me stagnant and unhappy. About two years ago, something just clicked. 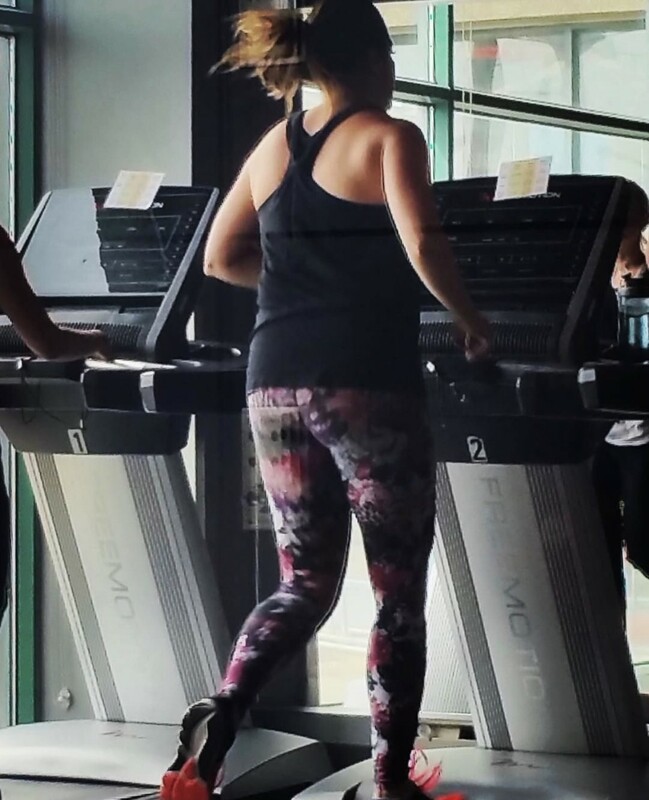 I had finally found a gym and workout that I loved and instead of filling me with dread, going to the gym 4-5 times per week was providing me with a new-found sense of mastery and confidence that I had never experienced before. I ditched the scale (I have not weighed myself in close to two years) and stopped the restrictive eating. I eat a really well-balanced variety of foods but when I want to have a piece of cheesecake, I will dig in, guilt-free. I made a conscious decision to no longer define my self-worth by the number on the scale and tried to focus on simply being healthy, feeling good, running faster and challenging myself. So here I am, having made all this inner progress. And for the most part, I am happy with my body. My arms are strong. My legs are firm and sturdy and can easily get me to the finish line of a 5k. But I’m going to be completely honest; I just can’t seem to embrace my soft, squishy belly. Yes, I realize that I housed a baby in that belly for 9 months, I am super proud of that. But I’m just not a fan of my tummy. I don’t go around beating myself up about it everyday. I don’t think my tummy makes me any less deserving of love. I just wish it was a little flatter, a little firmer. And it seems that the past 2 years at the gym hasn’t really gotten me closer to making this wish come true. So……I decided I would try this new procedure called CoolSculpting. Before you freak out, we’re not talking surgery or anything, this is a non-invasive procedure. It consists of applying a vacuum-type device to a fatty area on your body which freezes the fat cells, causing them to die. CoolSculpting claims that once frozen, these fat cells will disappear for good and that you can achieve a 20-25% reduction in the number of fat cells in the treated area. The procedure also boasts that there is no down-time. After doing some research about this procedure, I decided to contact Dr. Krasny and his team at Dermafina. The first step involved a consultation to discuss the details of the procedure and to answer any questions I had. 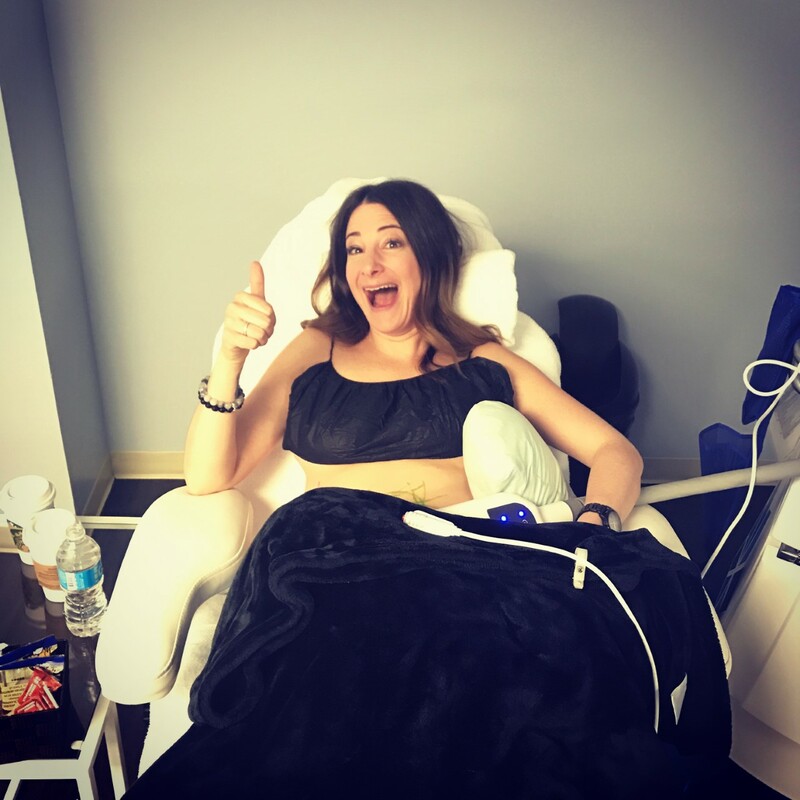 The treatment itself consisted of placing an applicator to a section of my tummy that delivered very cold air that is intended to freeze the fat cells. Not gonna lie, it stings for the first few minutes but after about 10 minutes, the treated area goes numb and I didn’t feel a thing. I then proceeded to kick back and relax for the duration of the treatment (which was 35 minutes for each section of my stomach). It will take several weeks for me to see the full results, but I’ll be sure to keep you posted! If you want to check out my full CoolSculpting experience, click here. This kind of procedure may not feel right for everyone, but it felt right for me. I think it felt right for me because I’ve done the work to achieve a solid foundation of confidence, self-respect and self-compassion. I think in the past, when my motivation was coming from a place of self-loathing and inadequacy , no amount of fat freezing would have sufficed. Like many other women, I’m still attempting to travel down that long, rocky path of genuine self-acceptance. But in the meantime, I figure a little CoolSculpting couldn’t hurt!